SO excited to knit this up! I am a huge fan of Magic Loop, so this is perfect. Thank you! I’m really going to have to figure out this circular needles thing. Oh, happy, happy!! You keep pushing me into making these surprising things – now, all you have to do is come up with a nice pattern for a Christmas star . . . Thank you for sharing this pattern. I want to knit one now. That is so cute!!! I am going to have to make a bunch of them even if it is almost summer and we don’t get acorns over here 🙂 Almost Jacaranda time tho….my favourite! I just made one Linda, first time knitting in the round. It came out fine, a few holes, I guess I didn’t pull the yarn tight enough. My Icord is a little thick so I would reduce the stitches next time.. I don’t have a yarn needle with me to sew up the threads.. I will practice then send you a photo. So much fun, thanks for the tutorial. Cute!! I’ve been on a mini knitting thing lately. 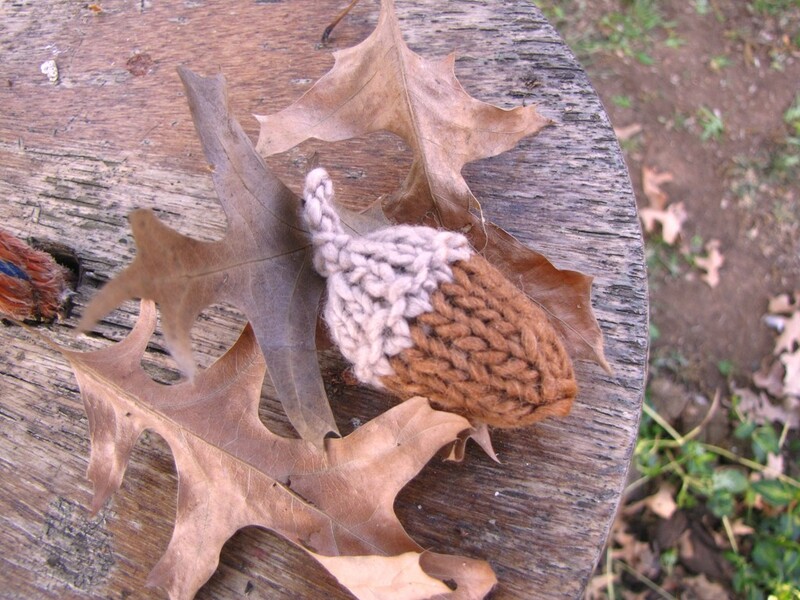 Mostly little hats and socks, but this acorn is adorable! I’m going to have to make one of these soon. Thanks for linking up to Crafty Friday! Those are adorable acorns! They’d even look cute in holiday colors and would make nice tree decorations. Happy Friday! That is precious! Thanks for sharing your pattern. I’ll make a few for our nature table. It’s darling! Thanks for sharing. another goreous pattern linda, many thanks for sharing! i am assuming i can knit them on dpn’s too, right (as i do not have any circulars larger that 12″)?? I just made one up, it only took abut 10 min.Just a note, you are starting with the acorn cap first, if you need to know what color to use first. Adorable fall pattern ! !Thanks for posting !! Thank You!!! Made three to hang from top of my grandaughter’s fall knitted hat…turned out darling. Had never used the magic loop technique before…fun day!